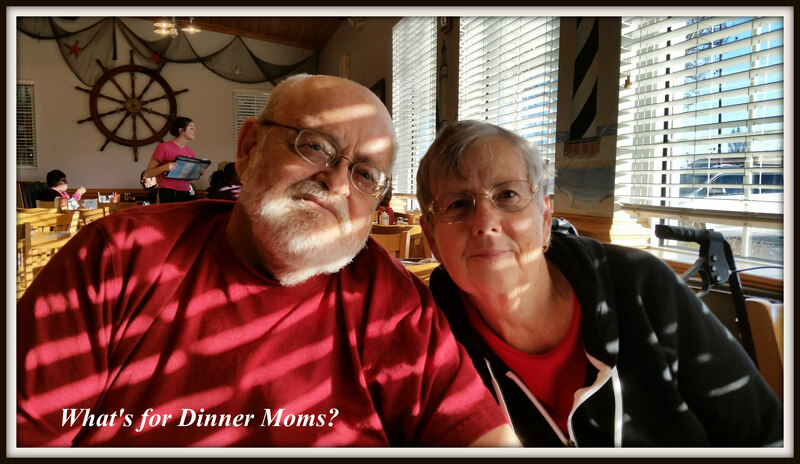 Finally Home and Back to “Real” Life – What's for Dinner Moms? 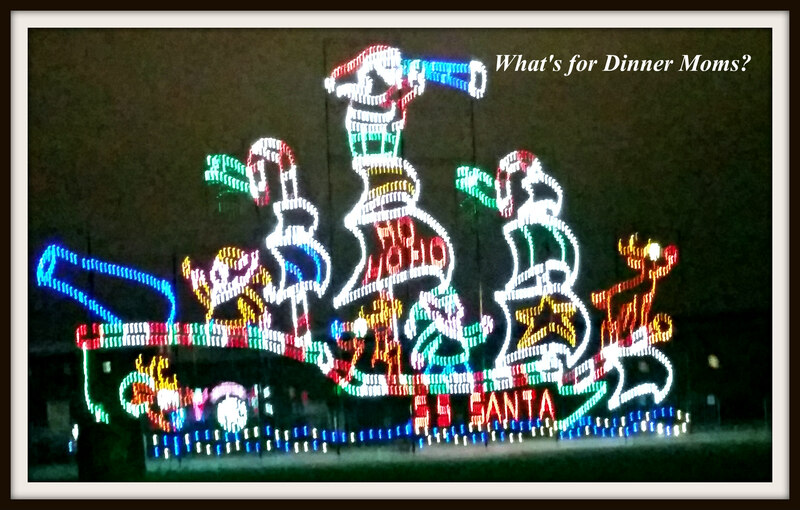 We had a relaxing time while there and got to do some fun things such as the Christmas Lights at the Charlotte Motor Speedway. This 3.5 mile drive through Christmas light display took over an hour to drive. It was even better than last year’s show. We were so surprised to see how much they changed it from last year. This was one of our favorite displays. The cannon shot gifts (in lights) over the roadway as you drove under the archway. The SS Santa with Santa as captain and Rudolph guiding the way. 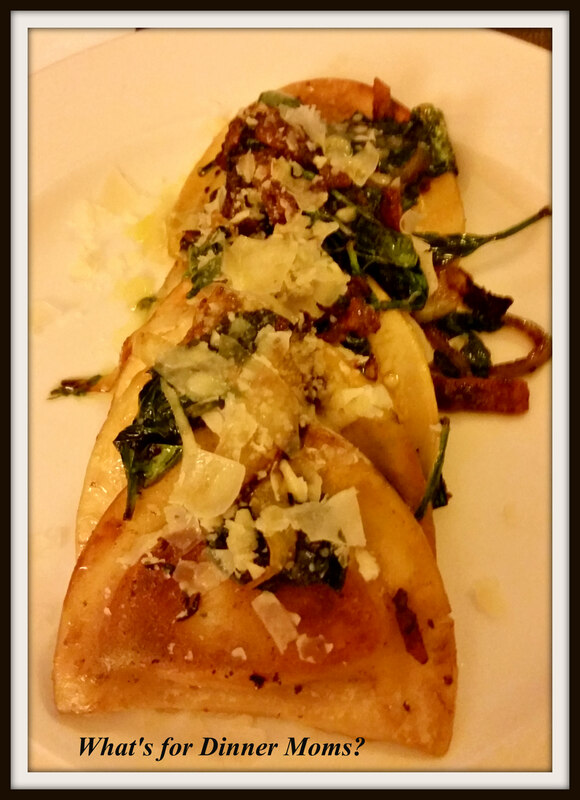 Pierogis with garlic, spinach, Parmesan cheese, caramelized onions, and bacon. Delicious! 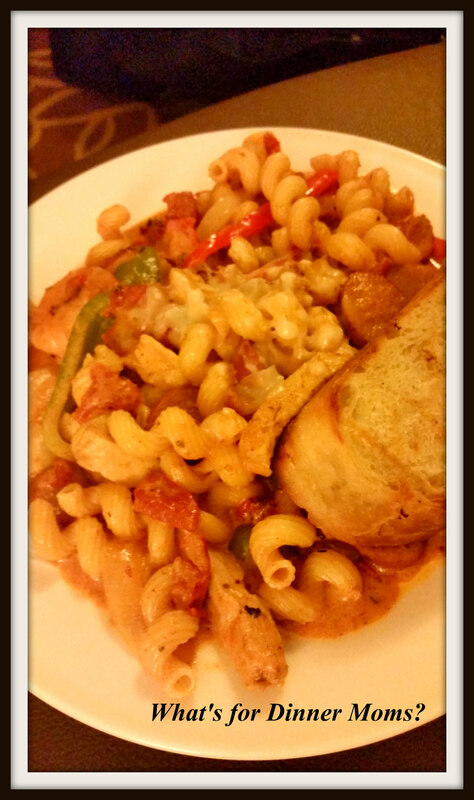 My son had a creamy Cajun Jambalaya Pasta that was both creamy and spicy. Can’t wait to give this one a try. He was asking me to taste it so we could recreate it. The Fish and Chips sandwich was actually quite tasty. They put cheese on everything. I think I have found a city after my own heart. I would never think to put cheese on a fish sandwich. 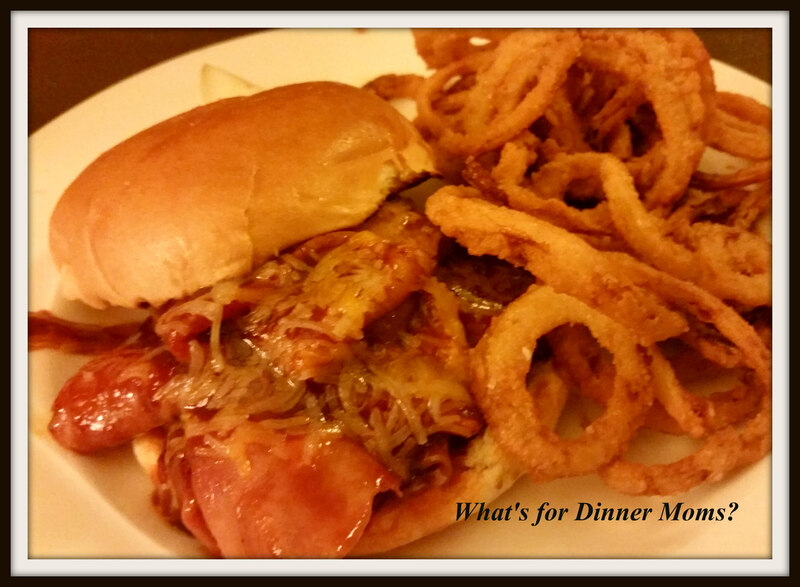 They called this the “Real Pittsburgher.” It was ham with a sweet barbecue sauce topped with shredded cheddar. 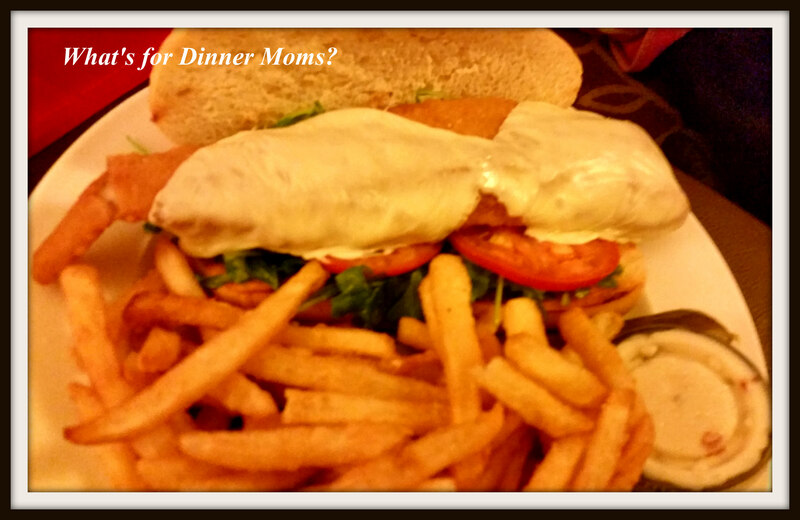 It was super delicious and another great idea for a simple meal! I love finding new things to try to make at home. 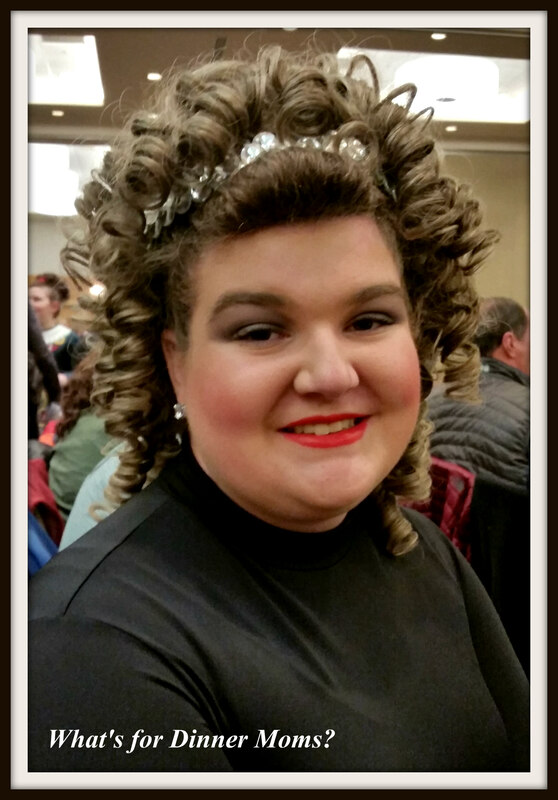 Then on our way home we drove to Pittsburgh, PA through two snowstorms in the mountains so my daughter could dance in a Feis on New Year’s Eve. We made it there safely. My daughter danced well. She is consistently placing in her reel again which was a problem for a while. So, she was pleased. I love the Black and White (or in this case the Black and Red) Feis because you don’t need to bring dresses and or wigs unless you want to. The dancers can wear appropriate clothing in black and red. No dress bags and heavy dresses to carry! But, there is something about vacations that I always need a vacation to recover from. No matter how relaxing the vacation was getting home and re-entering the real world seems to be so draining. I made sure before we left to get most of the things done that would make things that would make coming home seem easier. A clean kitchen and living room. All the beds had been stripped and remade. It was nice to only have to deal with the mountain of luggage and stuff from the car. Can’t wait to go away again but for now it is nice to be home! Previous Post Happy New Year and Thank You! Lovely post. Sounds like you had a great holiday but I agree, there is something about going away on holiday that is very exhausting. Sure is. I just can’t get going today. btw- you can correct the yellow color cast= white balance in post processing if you don’t make the change in camera before shooting. Shooting RAW is best. What program are you using for your post process/developing? If I can help let me know. I use Ribbit to add borders, text and stuff. Not sure how to change the colors. What is RAW? I am learning as I go. RAW is one way a camera captures the negative data. RAW captures the most data while JPEG is more limited and recovering it all in post is often not possible. Do you use your cell phone for your food photography, or it and another camera? I used to use a camera but now use my phone. do you use the camera that came with the cell phone? Have up added any other camera apps to your phone that have more features? Like adjusting exposure and white balance? White Balance is what is causing the yellow color cast in these food images? Look to see if your cell phone’s camera will let you adjust White Balance. It’s probably set on Auto right now. Ah, I never really looked at that. Everything was on auto. I’ll have to play with the different settings. I never added anything just what was on the phone when I got it. Thank you! Thank you! Hope you had a good holiday! 🙂 I am sure they are cute too! Thanks. Thank you. I hope I am the same way with my kids when I get to be their age. Welcome home Marci! Your camera (cell phone?) should have a white balance setting you can fix the yellow lighting with. The food looks great, though! Thanks! I just learned that today. All my settings were on auto. I need to play with them now. So glad you had a great vacation! Love all of the pictures! Thanks for sharing!